We had about a hundred people on three projects. The two new houses and the carrillo house. The roof on the Carrillo house is about half done. The two new ones are up about 7 rows of block. We should finish blocking tomorrow. Everyone is safe and having a great time. The weather was a perfect 70 degrees. We meet for an hour to get oriented and the worked from 9 to 5 . We have an incredible group. Thank you for your generous financial contributions and agreement to participate in the project this year. Because of your generosity and prompt delivery of financial contributions and, based on commitments that have been made, we will achieve our fund-raising goal and have enough funds to complete the two (2) houses along with other projects that will be listed below. Thank you. You have all done a great job. Two New Houses: The floors have been poured, the septic systems have been built and the corner blocks will be put in place so that we can begin construction promptly Monday morning. Carillo House: The masonry on the Carillo house has been finished and we will have a crew there to frame the interior, put the roof on and install doors and windows. Michiua House: The Michiua house is ready for a roof, interior framing, doors and windows. 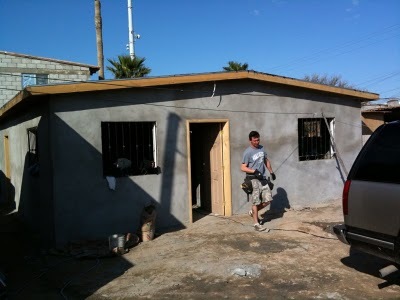 Meza House: The Meza house has been completed with paint, finish electrical and plumbing. Paulina House: The Paulina house has been completed with paint, finish electrical and plumbing. Lopez/Gomez: We delivered $1,800 worth of lumber to this family and they have built a roof on the new home that has been constructed after their house burned a few weeks ago. For those who are leaving the Phoenix area on Sunday, December 26th, there are families that want to caravan together and travel as a group. Several families will be flying in from Salt Lake City and obtaining rental cars and a few families from the Mesa area want to travel together. The best way to make this happen is for everyone to meet on the fringe of the Walmart Supercenter parking lot located at the northeast corner of Dysart Road and the I-10 Freeway. Those arriving from Salt Lake will have time to pick up their rental cars, drive to this area and pick up whatever food supplies they need at Walmart and maybe even a bite to eat for lunch at the In-N-Out Burger. Those coming from the Mesa area or anywhere east of Dysart would travel west on the I-10 as if you were going to California and exit the I-10 at Dysart. On the northeast corner of Dysart and the freeway, is an In-N-Out Burger and just east of that is the Walmart Supercenter. We will meet in the fringe area of the parking lot at 1:30 p.m. on Sunday, December 26, 2010. By this time, the folks from Salt Lake will have had time to pick up what they need and, if we are all there together at 1:30 p.m., we can then travel west on the 10 to the 85 and the south on the 85 all the way to Lukeville. If you have any questions about the time or the location for the meeting to join the caravan, please call Ralph Pew at 602-432-2329. If we all travel together, we can cross the border together later that afternoon and arrive in Rocky Point together as a group. Prior to leaving the Dysart and I-10 area, we will discuss procedures for crossing the border at Lukeville. We will begin our project with an organizational and devotional meeting at 8 a.m. on Monday, December 27, 2010. The meeting will be held in the conference center assembly room on the second floor of the convention building in Phase II of the Las Palomas Resort. For those of you staying at Las Palomas, this on the second floor just above the lobby where you will be checking in to make your room arrangements. For everyone’s benefit, attached to this e-mail is a map of Rocky Point that shows very clearly how to find your way to the Las Palomas Resort and to the project site. As you can see from the map, Boulevard Benito Juarez is the main boulevard coming in and out of Rocky Point. If you are going south into Rocky Point, turn right on the second signalized intersection and that road will cross the railroad tracks and then come to a round-about. Follow that round-about around the golf course and you can then easily follow the signs to the Las Palomas Resort. If you are coming from the Las Conchas area or anywhere east of Benito Juarez, you can take Boulevard Fremont to the main road and then turn left on Calle 13 and go the back way into the resort area. Tell the security staff at the gate that you are attending the meeting in Phase II. After passing the gate, stay to the right and go to the Phase II lobby, then up the stairs to the second floor assembly room. If any of you have questions as to how to find the Las Palomas Resort for attending this meeting, please call Ralph Pew at 602-432-2329. We are meeting at the Las Palomas convention assembly room because it is close to the project site and because the LDS building in downtown Rocky Point will be undergoing some remodeling at the time. Please be on time to this orientation meeting so that we can begin work on the site between 8:30 a.m. and 9 a.m. Monday morning. The two (2) new houses will be built in the small neighborhood just north of what many call the “cardboard mall.” This is the tourist commercial area on the road to Cholla Bay. The project site is shown in red on the attached map and is located just west of the railroad tracks at the far north end of this neighborhood. Just turn north on any one of the first three streets west of the tracks and drive to the end of whichever small neighborhood street you are on and you will see the project. Those working on the Carillo and Michiua houses will be given separate instructions at the meeting on Monday morning. We now have enough commitments for ladders and wheelbarrows from those who have e-mailed us to let us know that they can bring them. If you have not told us that you can bring wheelbarrows and ladders, please do not worry about that. We will have enough on site because we purchased a few new ladders and Julio is purchasing used wheelbarrows in Rocky Point so that we should have enough for the project. There is also no need to bring additional buckets. We have plenty of buckets on site. Another reminder: If you are traveling through the Phoenix area, please call Ralph Pew at 602-432-2329 to make arrangements to pick up a 5-gallon bucket of paint. If everyone takes a bucket of paint to Rocky Point, we will be able to deliver the (25) 5-gallon buckets that are in Ralph’s backyard. The t-shirts have been ordered and delivered and Jared Parker will have them available in Rocky Point. Unfortunately, the final cost for the t-shirts was $2.50 more per shirt than estimated. If you have ordered t-shirts, please find Jared Parker during the project and pay him the difference in the t-shirt cost. We are planning a fun family evening on Tuesday, December 28th. There will be authentic Mexican food, along with a live mariachi band and lots of fun getting to know everyone on the project and enjoying the evening together. We are still working on a location for the Fiesta because of the unavailability of the church building and we will let everyone know either Monday or Tuesday during the project where the Fiesta will be. Please plan on attending. This is a wonderful time to be together and to meet friends from other parts of the country and to enjoy a very pleasant evening with many of the local members of the LDS church that will be preparing the food for the event. Thanks to Dr. Bryce Barker and Dr. Rob Price, we will have emergency medical aid available on site. Please remember to obtain Mexican car insurance before leaving the states. There are plenty of places to purchase this insurance to Ajo or in Why. Please be cautious and careful in observing the speed limits in the border town of Sonoita. Remember the speed limits are posted in kilometers and, in many instances, it will feel as if you are crawling along at a snail’s pace. Families Helping Families has teamed up with Costa Vida (Foothill Village and American Fork Locations only) for a Fundraiser. All you need to do is come and eat Monday December 13th from 5-9pm, and Costa Vida will donate 20% of the proceeds to Families Helping Families. We have had great success the last two monday nights, and want to thank everyone who has come and support this fabulous fundraiser!! Exterior doors and security bars for the windows have been installed. Luis Ruiz, a local from Puerto Penasco has applied stucco to the interior side and exterior of the cinderblock walls. He and his family are working towards qualifying for a house next year. The stucco will be painted later this spring by Volunteers from the states. The rough plumbing is all installed and in an hour or so all the eletrical will be complete. Four electricians from Hogan Electric in Salt Lake City along with a local, Abram Martinez, are wiring the house.